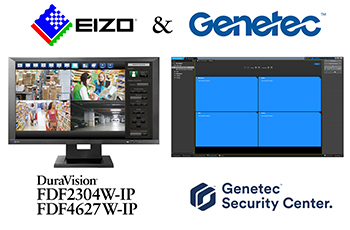 Hakusan, Japan, September 6, 2018 – EIZO Corporation (TSE: 6737) today announced that as part of a technical collaboration, Genetec Inc. has integrated a plugin for controlling EIZO’s DuraVision IP decoding monitors into its open architecture, unified security platform, Security Center, for streamlined functionality in security & surveillance environments. DuraVision FDF2304W-IP (23”) and FDF4627W-IP (46”) are EIZO’s IP decoding monitors which offer connection to multiple IP cameras, high-performance decoding technology, and customizable VMS integration. Genetec™ Security Center is a unified security platform that combines access control, video surveillance, automatic number plate recognition, communications, analytics, intrusion detection, and more for enhanced situational awareness and connectivity. EIZO and Genetec came together to design a plugin that meets highly requested end user requirements for security systems worldwide. By integrating with Security Center videowall framework, users can easily setup and manage IP monitors remotely, lending to the system’s open architecture for ease-of-use and reliable management. Using Security Center and DuraVision IP monitors, users can register and control the monitors from the same system as other installed security devices such as IP cameras, authorization systems, detection systems, and more. This streamlines both the installation process and user control by allowing for operation directly through the unified VMS. For environments which require the management of multiple IP cameras and monitors, initial installation and registration can be tedious. With the DuraVision IP monitor plugin for Security Center, operators no longer need to register each individual camera for every monitor if they are already registered through the VMS. This saves significant labor time and ensures quick and reliable setup. Using the Security Center user interface, operators can simply drag and drop the video feed from any registered camera to the desired position and the settings will automatically be reflected on the target IP monitor. The number and layout of video feeds can also be easily configured on the same screen, without needing to carry out additional settings separately through the monitor’s UI. The IP monitors can also support unique functions available from the Security Center events or alarm monitoring which can be communicated from the VMS to the IP monitor, instructing a special message and screen decorator to appear on the monitor display for enhanced visibility. “As a trusted technology partner with EIZO, Genetec is excited to be able to offer our security customers the extended benefits of the DuraVision IP monitor flexibility for multi-point, multi-user accessibility,” said Louis-René Bergeron, Product Manager for Integrations at Genetec Inc. “Built on an open architecture, Genetec Security Center offers its end users the possibility to add and expand their security platform to gain maximum operational efficiency,” added Louis-René. EIZO and Genetec will be demonstrating their respective products at Global Security Exchange (GSX) in Las Vegas, USA from September 25 - 27 and Security Essen in Essen, Germany from September 25 – 28. Visit the booths to see the products.